Investing in a super high horsepower blender will not only bring out the best quality and nutrients in your drinks but it will also last you a lifetime for everyday use. BLENDTEC HOME BLENDER HP3A Description Blendtec Home blender is the all-in-one appliance that makes great smoothies, fresh juices, ice cream, milkshakes, cappuccinos, margaritas, soups, sauces, bread dough, dressings, salsas and more! It replaces up to 9 other appliances with one fast easy-to-use machine, at a fraction of the cost. Blendtec Home blender is used in the best coffee shops, juice bars, gyms, and restaurants around the world. Blendtec machines are known for producing the best, most consistent results in taste and texture. 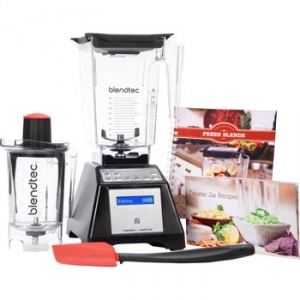 With the Blendtec Home blender , you’ll enjoy the same great commercial qualities at your home! Blendtec Home blender comes with our exclusive Smart-Touch Technology™ which means when a cycle button is pushed, the Blendtec Home blender automatically speeds up and slows down, then shuts off when the cycle is complete, so recipes turn out perfect every time. There are 25 pre-programmed blend cycles to choose from! You may also use the manual speed control. The nutrients will be packed in the juices or shakes that you make. Tired of your blender not being able to crush ice? The Blendtec Home blender has so much power (1560 Watts) it turns ice to snow and actually comes with an Ice-Crushing Guarantee. Blendtec Home blender grinds seeds and nuts into powder. You may want to add additional oil to the powder to get a buttery consistency. Blendtec Home blender can be used as the ultimate grinding and milling machine grinding whole grains into flour. 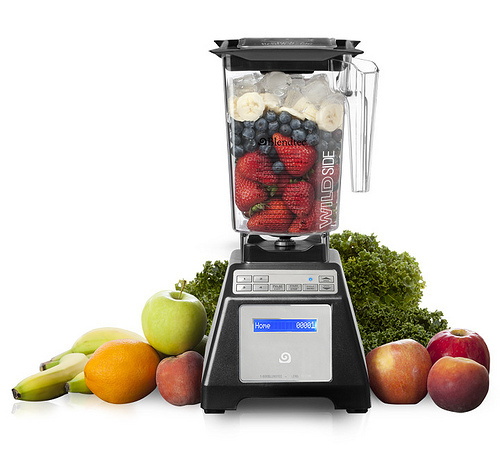 From the home gourmet chef to the everyday smoothie fan, the Blendtec Home blender fits your unique lifestyle. The Total Blender simplifies kitchen tasks from blending ice into snow or peanuts into peanut butter. Order now to begin enjoying the benefits of the Total Blender! There are four colors to choose from, White, Red and Black. Blendtec Home blender has a BPA-free vented lid to provide pressure relief for hot liquids. The cap is removable to allow easy addition of ingredients. The 2-quart jar is made from BPA-free copolyester, which is lightweight and ergonomically designed. The stainless steel blade design will cut through the toughest ingredients. Buttons 1, 2, 3, and 4 on the touch pad are pre-programmed cycles designed for easy-to-use recipes included in your recipe book. The cycles will start with the press of a button and will stop automatically when the cycle is complete. Button 5 is a speed key: This button is unique because it allows you to set the speed to your own desired setting. 1: Blends soft items such as ice creams and shakes. It runs for 27 seconds at low speed. This setting is ideal for soft fruits such as grapes, peaches and oranges. 2: Great granita and margarita cycle. Good for ice cubes, fruit syrups or concentrates. This is a short cycle at only 14 seconds varying between low and high speeds. Great for soft fruits. 3: This is the most frequently used speed of all. This button provides a robust cycle for more difficult “smoothies” or frozen drinks of fruit and ice. The cycle runs 23 seconds. This cycle handles firmer fruits such as apples, pineapple with the core, watermelon with seeds, etc. 4: This cycle is for frozen fruits and hard vegetables. This cycle fluctuates between lower and higher speeds to pull thicker materials into the blade. It is an excellent cycle for carrots, broccoli and hard materials such as whole wheat and rice. Button 5: The speed key. This key is used when one wishes to control the cycle. In this mode, the motor will run as long as 50 seconds and at whatever speed you select up to speed 10 (28,000 RPM plus). 6: The Pulse button provides one with the ability to chop foods or make chunky salsa’s by controlling the blade. The motor runs only while the “P” button is held down. For more information, please refer to the Information Manual. A recipe book is included. Storage Wash and leave to air-dry. Type Equipment Product of U.S.A.